Metcut prepares 30,000 test specimens each year. We manufacture these specimens from a variety of materials using controlled processes, including low-stress grinding. 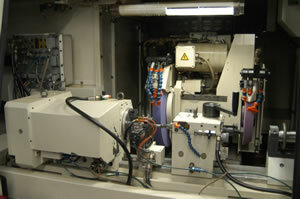 Our skilled operators machine specimens from raw stock or fabricated components. That raw stock comprises all metals (including titanium, superalloys, and refractory alloys); metal matrix composites; ceramic matrix composites; and other non-metallics. Specimen manufacturing can be part of a complete testing program, or a stand-alone service. We use specialized machining techniques–such as inertia welding, wire EDM, and CNC milling processes–to produce damage-free surfaces. We also utilize waterjet machining to minimize additional stresses to testing materials. Our waterjet system can cut materials up to 8” thick. This CNC-based tech allows for direct CAD geometry input as well as an integrated camera system to align and cut to any geometric form. We perform quality inspection on critical dimensions and attributes for all specimen groups. Along with test specimen manufacturing, our capabilities also feature EDM crack starter notching and the production of NDT calibration reference standards. 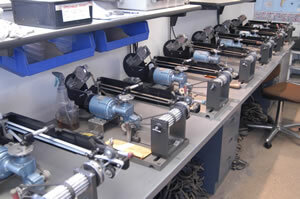 We also offer part modification for component testing, and can simulate a manufacturing process for a testing program.